Wednesday’s newspapers are as forceful in language as the Indian Air Force (IAF) had been in the attack on Jaish-e-Mohammed camp in Pakistan. Sobriety is left to the editorial pages. 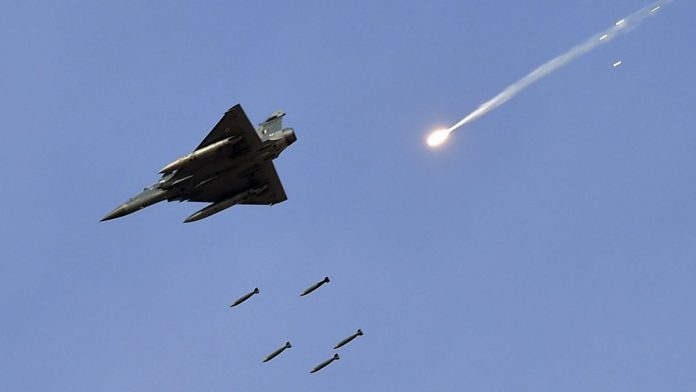 The IAF “bombed” (The Hindu), “struck” (The Indian Express) with “Jets to Jaish” (Economic Times), and “destroyed” (Hindustan Times) what the Times of India calls “a major Jaish-e-Mahammed terror training facility” in Pakistan’s Balakot region across the Line of Control. Express’s headline is military: “India strikes terror, deep in Pak.” The Times of India highlights, with red ink, IAF in its “India’s Avenging Force”. TOI’s busy page 1 entirely devoted to the airstrike, has two unusual stories: in “Facility was posh…” it claims to have “exclusively accessed” photographs and documents of the “five-star terror training facility, complete with a swimming pool and gymnasium” that was bombed, but offers none as evidence to readers. On page 16, it carries a tiny photograph of the “facility,” credited to ANI. Dainik Jagran says, “Pulwama ka hisab poora” (Revenge for Pulwama complete) Amar Ujala says “Pakistan mein ghuskar jaish ke teen badey thikane tabah” (Three big Jaish camps destroyed inside Pakistan’) and Dainik Bhaskar says, “Airforce ne 48 saal baad Pakistan ki Sarhad langhi, aatanki adda tabah” (Indian Air Force entered Pakistan border after 48 years and destroyed the terror camp). Amar Ujala has made a graphic of the Balakot camp site and Modi wearing the Azad Hind Fauz cap. Comment on the IAF’s airstrikes is as “calibrated” across the major newspapers, as it finds India’s response. HT’s “Airstrikes: India’s clever counter…” says the airstrike “proves that (Pakistan) may have overused its terrorism-under-the nuclear-umbrella card.” For the “first time” a nuclear power has used “airpower to strike inside the territory of another nuclear power.” The strike has show Pakistan’s vulnerability to conventional attacks. Now, if Pakistan escalates hostilities, “it further expands the space for conventional warfare below the nuclear threshold” unless it “uncorks” its nuclear arsenal. Jagran, in its editorial, says that it had become imperative for India to take strong action and teach Pakistan a lesson and send a message to Pakistan that India would not be taken in by their ‘chaalbaazi‘. Along side the Indian government should take concrete steps to improve the ground situation in Kashmir, it writes. Bhaskar says a strong message to Pakistan and terrorists was a must. What India did, says the editorial, was a must for any self respecting nation. “This message had to be sent that those who indulge in terrorist acts would not be spared”, it writes. Some Hindi channels like Aaj Tak and Republic Bharat went to the public for reactions: “Vande Mataram” and “Jai Hind” was the response. Times Now anchor Padmaja Joshi, who used to anchor India Today’s People’s Court, discussed the takeaways for India from the air strikes. On India Today, anchor Rahul Kanwal’s “War Room” discussed the IAF’s success. At Harvest TV, Gen Singh explained Pakistan’s denial and then threat of retaliation: “(they) have a tradition of denial” and “tight” media control. The Republic TV debate opened by calling Pakistan defence minister a “joker”. It lauded the airstrike, with an ominous musical accompaniment. Zee News anchor Sudhir Chaudhary said that after IAF strikes, “Pakistan has gone totally mad” and is “confused” about what to do next. For all those looking at today’s air strikes through a political/electoral prism it might be worth remembering that PM Vajpayee went in to the 1999 elections with nuclear tests AND victory in Kargil under his belt & still only returned to power with a coalition.